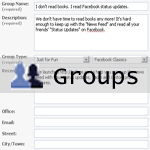 So please join our new Facebook group “I don’t read books. I read Facebook status updates” (link below). And when we have thousands of members I promise not to change the group’s name to “Sometimes I like to pee in the shower“. But I suggest you keep an eye on any other groups you belong to (under Groups > My Groups). Posted by Pieter on February 26, 2009 at 3:18 PM. Use this trackback if you're linking this story.